Permanent teeth of right half of lower dental arch, seen from above. In this diagram, a healthy wisdom tooth is included. The molars or molar teeth are large, flat teeth at the back of the mouth. They are more developed in mammals. They are used primarily to grind food during chewing. 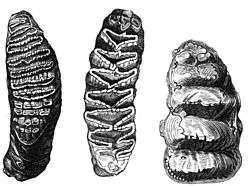 The name molar derives from Latin, molaris dens, meaning "millstone tooth", from "mola", millstone and dens, tooth. Molars show a great deal of diversity in size and shape across mammal groups. 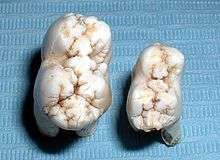 In humans, the molar teeth have either four or five cusps. Adult humans have twelve molars, in four groups of three at the back of the mouth. 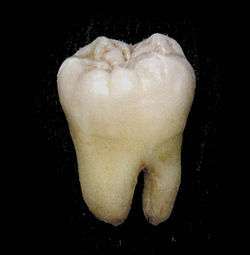 The third, rearmost molar in each group is called a wisdom tooth. It is the last tooth to appear, breaking through the front of the gum at about the age of twenty, although this varies from individual to individual. Ethnicity can also affect the age at which this occurs, with statistical variations between groups. In some cases, it may not even erupt at all. The human mouth contains upper (maxillary) and lower (mandibular) molars. They are: maxillary first molar, maxillary second molar, maxillary third molar, mandibular first molar, mandibular second molar, and mandibular third molar. In mammals, the crown of the molars and premolars are folded into a wide range of complex shapes. The basic elements of the crown are the more or less conical projections called cusps and the valleys that separate them. The cusps contain both dentine and enamel, whereas minor projections on the crown, called crenullations, are the result of different enamel thickness. Cusps are occasionally joined to form ridges and expanded to form crests. Cingula are often incomplete ridges that pass around the base of the crown. These mammalian multi-cusped cheek teeth probably evolved from single-cusped teeth in reptilians, although the diversity of therapsid molar patterns and the complexity in the molars of the earliest mammals makes it impossible to determine how this happened. According to the widely accepted "differentiation theory", additional cusps have arisen by budding or outgrowth from the crown, while the rivalling "concrescence theory" instead proposes that complex teeth evolved by the clustering of originally separate conical teeth. It is generally agreed that therian mammals (placentals and marsupials) evolved from an ancestor with tribosphenic cheek teeth, with three main cusps arranged in a triangle. Comparison of cheek teeth in various taxa: 1, Reptile; 2, Dromatherium (a Triassic Cynodont); 3, Microconodon (a Triassic Eucynodont); 4, Spalacotherium (a Cretaceous Symmetrodont); 5, Amphitherium (a Jurassic mammal). Each major cusp on an upper molar is called a cone and is identified by a prefix dependent on its relative location on the tooth: proto-, para-, meta-, hypo-, and ento-. Suffixes are added to these names: -id is added to cusps on a lower molar (e.g., protoconid); -ule to a minor cusp (e.g., protoconulid). A shelf-like ridge on the lower part of the crown (on an upper molar) is called a cingulum; the same feature on the lower molar a cingulid, and a minor cusp on these, for example, a cingular cuspule or conulid. Generalized tribosphenic molar. The protocone is on the lingual (tongue) side, while the anterior paracone and posterior metacone are on the buccal (cheek) side of the jaw). The design that is considered one of the most important characteristics of mammals is a three-cusped shape called a tribosphenic molar. This molar design has two important features: the trigonid, or shearing end, and the talonid, or crushing heel. 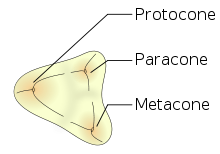 In modern tribosphenic molars, the trigonid is towards the front of the jaw and the talonid towards the rear. The tribosphenic tooth is found in insectivores and young platypuses (adults have no teeth). Upper molars look like three-pointed mountain ranges; lowers look like two peaks and a third off to the side. The tribosphenic design appears primitively in all groups of mammals. Some paleontologists believe that it developed independently in monotremes (or australosphenidans), rather than being inherited from an ancestor that they share with marsupials and placentals (or boreosphenidans); but this idea has critics and the debate is still going on. For example, the dentition of the Early Cretaceous monotreme Steropodon is similar to those of Peramus and dryolestoids, which suggests that monotremes are related to some pre-tribosphenic therian mammals, but, on the other hand, the status of neither of these two groups is well-established. Some Jurassic mammals, such as Shuotherium and Pseudotribos, have "reversed tribosphenic" molars, in which the talonid is towards the front. This variant is regarded as an example of convergent evolution. 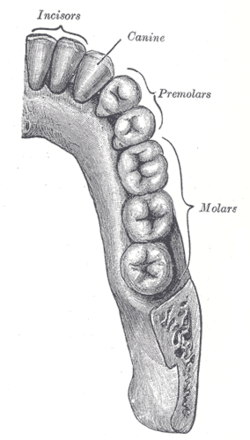 From the primitive tribosphenic tooth, molars have diversified into several unique morphologies. In many groups, a fourth cusp, the hypocone (hyponconid), subsequently evolved (see below). Quadrate (also called quadritubercular or euthemorphic) molars have an additional fourth cusp on the lingual (tongue) side called the hypocone, located posterior to the protocone. 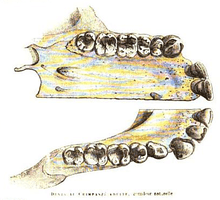 Quadrate molars appeared early in mammal evolution and are present in many species, including hedgehogs, raccoons, and many primates, including humans. There may be a fifth cusp. In many mammals, additional smaller cusps called conules appear between the larger cusps. They are named after their locations, e.g. a paraconule is located between a paracone and a metacone, a hypoconulid is located between a hypoconid and an entoconid. In bunodont molars, the cusps are low and rounded hills rather than sharp peaks. They are most common among omnivores such as pigs, bears and humans. Bunodont molars are effective crushing devices and often basically quadrate in shape. Hypsodont dentition is characterized by high-crowned teeth and enamel that extends far past the gum line, which provides extra material for wear and tear. Some examples of animals with hypsodont dentition are cows and horses; all animals that feed on gritty, fibrous material. Hypsodont molars can continue to grow throughout life, for example in some species of Arvicolinae (herbivorous rodents). Hypsodont molars lack both crown and neck. The occlusal surface is rough and mostly flat, adapted for crushing and grinding plant material. The body is covered with cementum both above and below the gingival line, below which is a layer of enamel covering the entire length of the body. The cementum and the enamel invaginate into the thick layer of dentin. The opposite condition to hypsodont is called brachydont or brachyodont (from brachys, "short"). It is a type of dentition characterized by low-crowned teeth. Human teeth are brachydont. A brachydont tooth has a crown above the gingival line and a neck just below it, and at least one root. A cap of enamel covers the crown and extends down to the neck. Cementum is only found below the gingival line. The occlusal surfaces tend to be pointed, well-suited for holding prey and tearing and shredding. Zalambdodont molars have three cusps, one larger on the lingual side and two smaller on the labial side, joined by two crests that forms a V- or lambda-shape. The larger inner cusp might be homologous with the paracone in a tribosphenic molar, but can also be fused with the metacone. The protocone is typically missing. The two smaller labial cusps are located on an expanded shelf called the stylar shelf. Zalambdodont molars are found in for example golden moles and solenodons. Like zalambdodont molars, dilambdodont molars have a distinct ectoloph but shaped like two lambdas or a W. On the lingual side, at the bottom of the W, are the metacone and paracone, and the stylar shelf is on the labial side. A protocone is present lingual to the ectoloph. Dilambdodont molars are present in shrews, moles, and some insectivorous bats. Lophodont teeth are easily identified by the patterns of ridges or lophs of enamel interconnecting the cusps on the crowns. Present in most herbivores, these patterns of lophs can be a simple ring-like edge, like in mole rats, or a complex arrangement of series of ridges and cross-ridges, as those in odd-toed ungulates, such as horses. Lophodont molars have hard and elongated enamel ridges called lophs oriented either along or perpendicular to the dental row. Lophodont molars are common in herbivores that grind their food thoroughly. Examples include tapirs, manatees, and many rodents. When two lophs form transverse, often ring-shaped, ridges on a tooth, the arrangement is called bilophodont. This pattern is common in primates, but can also be found in lagomorphs (hare, rabbits, and pikas) and some rodents. Extreme forms of lophodonty in elephants and some rodents (such as Otomys) is known as loxodonty. The African elephant belongs to a genus called Loxodonta because of this feature. In selenodont molars (so-named after moon goddess Selene), the major cusp is elongated into crescent-shape ridge. Examples include most even-toed ungulates, such as cows and deer. Many carnivorous mammals have enlarged and blade-like teeth especially adapted for slicing and chopping called carnassials. A general term for such blade-like teeth is secodont or plagiaulacoid. ↑ Rozkovcová, E; Marková, M; Dolejsí, J (1999). "Studies on agenesis of third molars amongst populations of different origin.". Sbornik lekarsky. 100 (2): 71–84. PMID 11220165. Luo, Z.-X. ; Ji, Q.; Yuan, C.-X. (November 2007). "Convergent dental adaptations in pseudo-tribosphenic and tribosphenic mammals". Nature. 450 (7166): 93–97. doi:10.1038/nature06221. PMID 17972884. Stokstad, E. (January 2001). "Tooth Theory Revises History of Mammals". Science. 291 (5501): 26. doi:10.1126/science.10.1126/SCIENCE.291.5501.26. PMID 11191993. Zhao, Z.; Weiss, K. M.; Stock, D. W. (2000). "Development and evolution of dentition patterns and their genetic basis". In Teaford, Mark F; Smith, Moya Meredith; Ferguson, Mark WJ. Development, Function and Evolution of Teeth. Cambridge University Press. pp. 152–72. ISBN 978-0-511-06568-2.